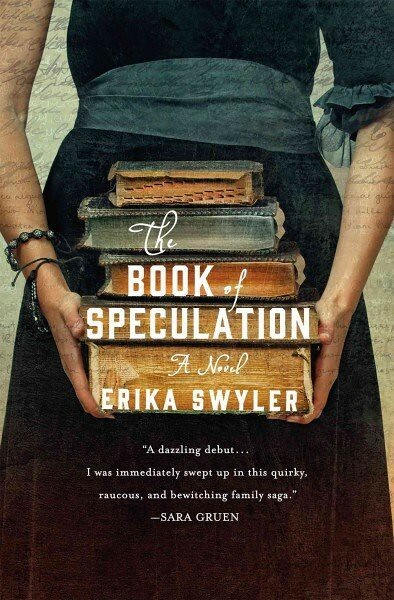 A review of The Book of Speculation by Erika Swyler. Post may contain affiliate links. Unfortunately I’ve let two weeks go by since finishing this book and writing this review. I hate when I do that, memories and details become unclear. But I enjoyed this book so much, that I have to write about it. First of all, I do judge a book by it’s cover and I loved this cover. I chose The Book of Speculation: A Novel immediately after seeing the gorgeous cover with the stack of old books. Then when I read about what the book was about, I knew I’d made a good decision. The story alternates between a traveling circus in the 1700’s and the modern day narrator, Simon. As we meet Simon, we learn that members in his family have an unusual ability to hold their breath under water. Simon’s mother, Paulina, was a circus and carnival performer and fortune-teller who had made her living as a mermaid by holding her breath. Simon receives a package containing a curious old book from an antique book seller. The seller has included a note that states that he found Simon’s grandmother’s name, Verona Bond, inside it and thought that Simon should have the book. The book is very old and water damaged and appears to be the tale of Mr. Peabody’s Circus. Simon can’t imagine why his grandmother’s name is in the book. As Simon is immediately pulled into the history of the book now, we also follow what is happening in Mr. Peabody’s circus. This alternating time line works very well with the subject of the book. I loved this book from beginning to end. I found it’s mix of magic and circus lore entertaining. I always like to write my thoughts about a book right away too. I inevitably have thoughts that have to be recorded or they will be lost forever. Time is not my friend 🙂 This sounds like a good one! You should read The Mapmaker’s Children. Alternating time lines in that one, too, which I enjoy. This sounds like it was a good book.